This highly original and challenging study offers an examination of the tensions which exist between the two most important sources of international law: Treaty and Custom. 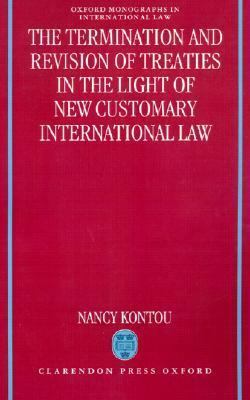 Through detailed analysis of State Practice and key decisions of International Tribunals Dr Kontou considers the circumstances by which new customary law may abrogate the obligations of a prior Treaty, and argues that there is a special category of situations which supports the right of a state to re-negotiate a Treaty by an appeal to new customary law.Kontou, Nancy is the author of 'Termination and Revision of Treaties in the Light of New Customary International Law', published 1994 under ISBN 9780198258421 and ISBN 0198258429. Loading marketplace prices 60 copies from $154.37 How does the rental process work?